While Apple is obviously unlikely to announce a new iPhone generation anytime soon, the development of the company's XS, XS Max, and XR sequels has started months ago, with actual production to follow at some point this summer ahead of a traditional fall release. That means well-connected insiders may already know a thing or two about Cupertino's 2019 upgrade plans, but unfortunately, it's not always easy to discern these reliable sources detailing trustworthy information from the false prophets relaying mere guesses and unfounded speculation. Of course, the reputation and track record of certain leakers and analysts, like Steve Hemmerstoffer and Ming Chi-Kuo, generally makes their predictions rise above the crowd. Then you have blogs like Japan's Macotakara, which are sometimes wrong and sometimes right in foreshadowing new iPhone designs and features, making our lives pretty difficult as we try to offer you the most complete and credible picture of what's to come. Macotakara's latest report is a little confusing, as it fails to specifically mention how many 2019 iPhone models are in the pipeline. We were naturally expecting three, directly following in the footsteps of 2018's iPhone XS, XS Max, and XR, but this new batch of rumors could be interpreted to anticipate as many as five different variants, only two of which will sport triple rear-facing camera units. Then again, a more realistic interpretation would be that Apple is simply gearing up to release a refreshed iPhone XR with two shooters on its back and an LCD panel of unspecified size, as well as iPhone XS and XS Max sequels with 6.1 and 6.5-inch OLED screens respectively. The iPhone XI (or 11, or XIs) is tipped to go up against the "regular" Samsung Galaxy S10, actually squeezing between the 5.8-inch XS and 6.1-inch XR in terms of its footprint. But where would that leave the iPhone XR (2019)? We honestly have no idea, but perhaps Apple is planning a size increase for that model after all. What seems pretty much etched in stone is that Apple has no intention to keep the three rear cameras exclusive to the largest 2019 iPhone version. Both that and its little OLED brother are expected to rock "large lens units" with increased sensor sizes too. There's no new word on the actual design of this camera arrangement, but all recent signs are pointing in the direction of a divisive square with a pronounced protrusion. 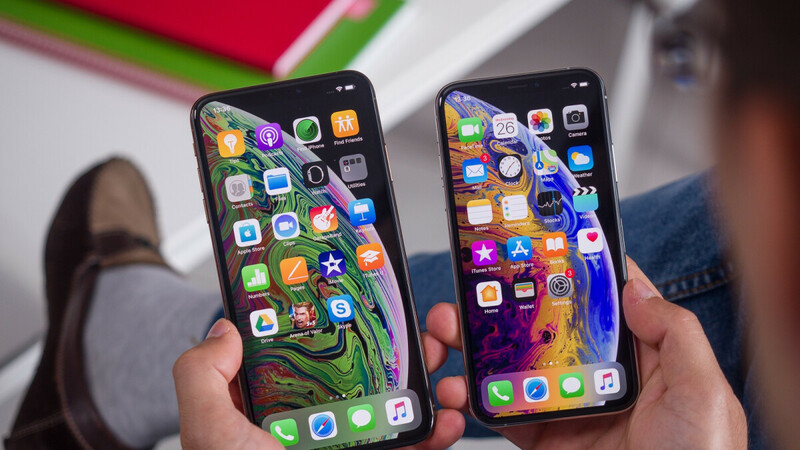 Whether we're looking at three or five iPhone 11 variants (certain sources are even suggesting six could be on the table, with triple-camera models of XS, XS Max, and XR sequels possible), it's probably safe to expect another Lightning-connected generation. Apple may have switched to USB-C ports for 2018's iPad Pros, but the best we can hope as far as 2019's iPhones are concerned is to get a USB-C to Lightning cable in the box. Also, a speedy 18W USB-C power adapter that's currently sold for $29 separately from 2018 iPhones and the aforementioned cable. Of course, there's a strong possibility only these triple-camera versions with OLED screens will get all that included as standard, alongside bilateral wireless charging. The latter feature would be a replica of Samsung's Wireless PowerShare functionality and Huawei's Wireless Reverse Charging technology, allowing you to juice up your fancy new AirPods (with a wireless charging case) straight from your next iPhone. Finally, Macotakara claims the 6.1-inch next-gen OLED iPhone could be around 0.15 mm thinner than the already slender 7.7 mm XS, while the 6.5-incher is projected to beat the thinness of the 7.7 mm XS Max by a significant 0.4 mm. That sounds great... as long as Apple can find a way to also boost the two's battery capacity. The rendering is fugly. Not the actual phones. What???? If Apple does that with the camera, its ugly. Just like the renders of the notch was ugly, and the end result is no different. I like that overall, Apple is trying to keep the iconic iPhone design over the years. However, as you can see, the design is now so crippled, because Apple refuses to make some simple changes. They need to centralize the camera. And why does the iPhone still have a bump? Other OEM's were severely criticized over camera bumps, Apple still has one in the most awkward place. So making the camera bigger and leaving it in an awkward place is a bad idea. and it is ugly and it will be on the real thing too. Hoping for 120Hz screens. If Apple has to go back to LCD to make this happen, fine with me. After using my 120Hz iPad Pro, I cannot accept 60Hz screens anymore. If Apple does not go for 120Hz, I might need to try Razer or Asus ROG phone even though the latter is 90Hz. Considering what kind of pressure Apple put on brightness and color depth on their iPhones, they need to cut the power down before any drastical upgrade can occur. Regarding 120Hz Apple watch series 4 has LTPO tech which could potentially enable high refresh on OLED in the way Apple wants (read: the best way). If/when they decide to include their custom TCON to make that happen remains a mystery. At first I didn't care for the protruding sponge bob square camera, however, its growing on me. Let's hope for similar zoom in performance and low light performance. I think Apple can pull this out. What do buyers want? Bigger batteries in their phones. What do buyers get? Thinner phones with small batteries. I never saw anyone praising hiw thin a phone are, did you? They also praise the design, the design they promptly cover in a case to protect. Not me! Give me plastic, and a huge battery. I don’t care how thick it is, I ain’t dainty. This thing is an expensive tool, not a fashion accessory. We all know apple do a big change every 4yrs. Dont expect anything big this yr its only yr 3. Makes no sense for 6.1” and 6:5”. Apple should have gone for 7” device over the 6.5” same size and design. Thinner bodies and larger batteries. Sounds good.. There are other phones with MORE hardware inside, are roughly the same size as the iPhone, and already have bigger batteries. Thinner bodies? Yeah just what we need so they can bend in your pocket. They are already thin enough. i or 2 more MM isn't gonna be be noticed.